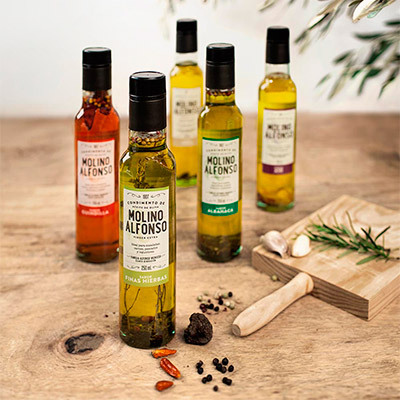 Founded in 1907, Molino Alfonso has been producing the best olive oil of the centenaries olive trees of Belchite region, province of Zaragoza, roughly equidistant from the Mediterranean and Pyrenees, in north-eastern Spain. 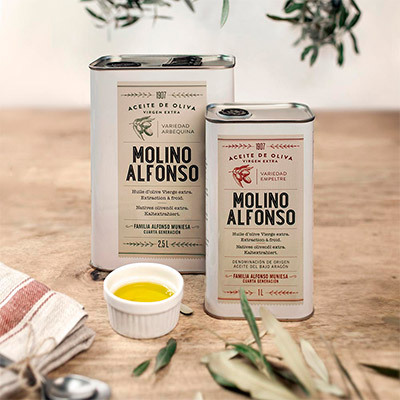 Dedicated to the production, packaging and commercialization of Extra Virgin Olive Oil with Bajo Aragón Denomination of Origin. 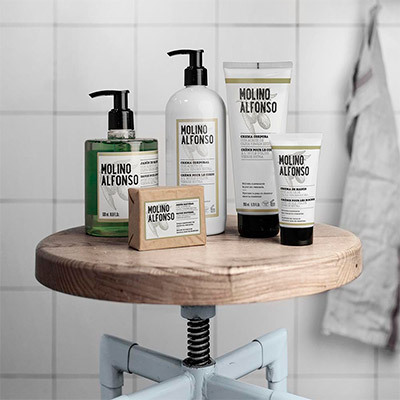 We have developed a line of natural cosmetics formulated with extra virgin olive oil. We promote the Oleoturismo, a new form of tourism, so that you can know our Oil mill and attend tastings and workshops of our Bajo Aragón oil. From the best olives at the optimum moment of their maturity, we harvest the olive at the end of October to produce the first oils of the season. Varieties: Arbequina, Empeltre and Coupage. Available in two varieties Empeltre and Arbequina. The oil has been made by selecting the best olive stocks, cold and taking care of the entire production process. They are oils of soft character and have a pleasant taste, in which its aroma is shown intensely. To aromatize these olive oils we have chosen the variety Empeltre. Its soft taste and light aroma make this variety the most optimal for a natural maceration with spices. Garlic, Basil, Chili Pepper, Black Truffle and Fine Herbs. Surprise family and friends with premium quality oil in an original case. Each harvest we select the best olives, at their optimum ripeness to obtain exquisite oils made at very low temperature. The first oils of the campaign. Varieties: Arbequina, Empeltre and Coupage. 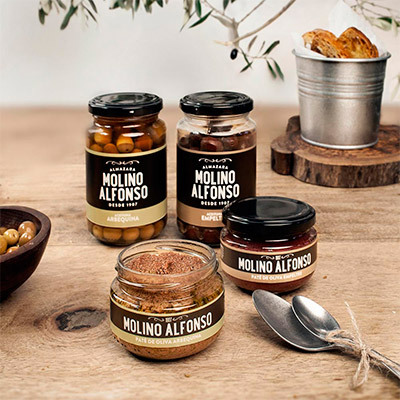 Totally natural and handmade, with selected olives of the highest quality and the best extra virgin olive oil. Varieties: Empeltre and Arbequina. Traditionally olive oil has been highly valued for its moisturizing, healing and regenerating properties of the skin. 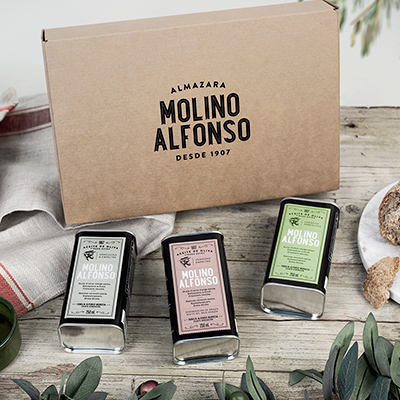 For 20 years we have had our own line of cosmetics made with our extra virgin olive oil. 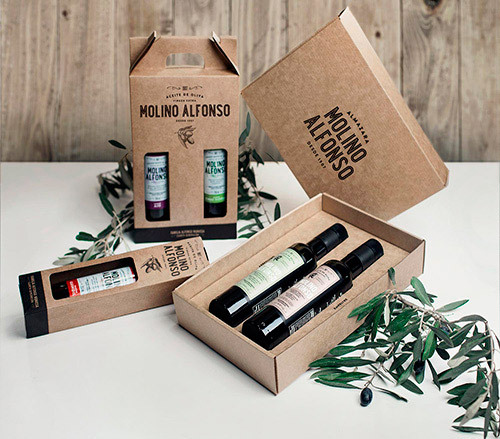 We prepare all kinds of gift boxes and details for companies, public institutions, celebrations and events in which to surprise guests with delicious olive oil from Bajo Aragón. We customize the oil bottles and cans with unique labels to commemorate the event. Oleoturismo is another form of tourism. We organize visits to our mill for individuals or groups, show them our facilities, and guide them in all the process of elaboration Extra Virgin Olive Oil. 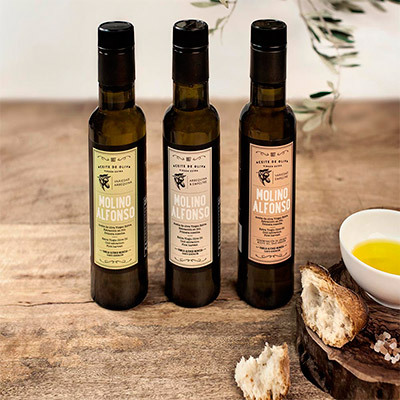 We hold oil tastings and workshops on Bajo Aragón olive oil.